Visiting a historic house, old cathedral, castle, or a town with rich history could feel a little bit like time travel. Stepping with half a foot into another era is not only fun. These trips into the past also unquestionably contribute to our children’s informal education, nurture their imagination, put their knowledge into context, encourage critical thinking about the past, and even put our own lifestyles into perspective. For our family, one of these exciting trips was a visit to Esteháza, an estate with a grandiose palace located in western Hungary. As the large structure emerged in front of us (the front of the building is 100 meters long, the wings measure 46 meters), the kids first question was: Was this actually someone’s home? The answer to this question is yes, but it wasn’t the family’s primary residence. The 126-room palace was just a summer house in rural Hungary, far away from Vienna. The palace, built by Prince Nikolaus Esterházy, is often referred to as the Hungarian Versailles, although perhaps it has more in common with the Viennese Schönbrunn Palace. The glory days of the estate lasted from 1766 (when the main part of the palace was finished) till 1790, with the death of Prince Nikolaus Esterházy. Because of the estate’s remote location, his successors didn’t deem it a desirable place to live. Although today no one would consider the place to be far from Vienna (only 60 miles), it still feels remote and rural. We got off the train at the nearest train station, which was about 2 miles from the palace. As it turned out, the small town has no public transportation and not even a taxi service. So lots of walking was part of our day. 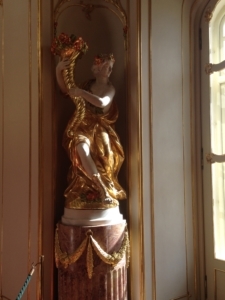 Inside of the palace, the children wanted to run up and down the wide staircase, touch the golden rococo floral decorations on the wall, and explore the rooms. They fantasized about how much fun it would be to play hide-and-seek, to explore the attic, or look for secret doors. Of course, none of these were an option. So instead they tried to listen to the guide and take it all in. 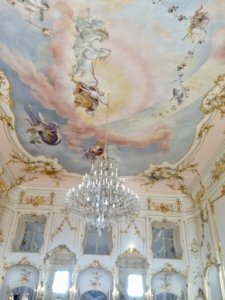 We admired the enormous mirrors, the furniture, the frescoes and chandeliers on the ceiling, and the huge wood burning stoves that had been fed by the servants from the adjacent rooms. In the Banquet Room, my daughter was imagining balls that might have taken place there long ago. She saw hundreds of candles burning, women in beautiful dresses, heard the music and wished that she could be one of the dancers. We learned from the guide that the estate hosted not only balls, but also large hunts and big feasts. The most likely foods served were veal, rabbit, lamb and mutton, poultry, wild birds, and fish; all accompanied with sauces flavored by spices and nuts. The guests probably also enjoyed pates and rice porridge with spices, prepared by the many cooks of the estate. Exotic fruits, like oranges and lemons, were served. Chocolate biscuits and marzipan, a popular dessert of the era, might had been offered to the guests. The Price, patron of the arts, also hosted concerts, opera, and theater performances. The estate had its own Opera House (seating 400 people), Marionette Theater, and a Music House with apartments for the musicians, actors, and dancers employed by the prince. The orchestra was led by none other than the celebrated composer Joseph Haydn. Haydn lived on the estate from 1766 to 1790. The majority of his symphonies were written for the Prince’s orchestra, and they were most likely performed for the first time in Esterháza. As we walked through the estate’s extensive park back to the train station, my daughter expressed her desire to live in a palace. Then we tried to imagine the everyday life in the Esterházy Palace 250 years ago. The lifestyle of 18th century aristocracy seemed lavish, but extremely wasteful; grand, but perhaps not very comfortable. After all, they lived in times when 60 miles was a great distance. Their luxurious palaces had no electricity, central heating, or plumbing. They wore fancy, but most likely uncomfortable clothing. My kids wondered if Prince Esterházy would have perhaps preferred to live in our heated house with a nice bathroom, wear a cotton T-shirt, and listen to music every day without having to provide food and accommodation for musicians of an orchestra. Empire in the 18th century. Making the dough itself requires skill, time and patience. The dough is rolled out, then gently stretched by hand until it’s paper-thin. Then it is filled and rolled up. Popular fillings include apple, sour cherry, poppy seed, and quark. Today not many home bakers take on the challenge of making the strudel dough. Most bakers rely on store-bought dough. 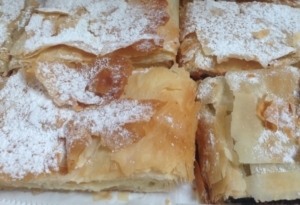 Filo dough is a good substitute for dough made from scratch. Preheat the oven to 375 °F. Lightly brush a 13×9-inch baking dish with melted butter. Prepare the filling. Put the quark/farmer’s cheese into a mixing bowl. Add egg yolks, sour cream, sugar, salt, vanilla extract, lemon zest, and raisin. Beat the egg whites until stiff, then gently fold them in the quark mixture. Cover your work surface with a clean kitchen towel. Place a sheet of filo on the towel (with the long side facing you) and gently brush it with the melted butter. Layer three more filo sheets, buttering each layer. Sprinkle 1 tablespoon of breadcrumbs in a 3-inch strip along the longer end of the dough, leaving an inch on the bottom and the sides without any crumbs. Gently spread half of the cheese mixture on top of the breadcrumbs then sprinkle with another tablespoon of breadcrumbs. Fold the unfilled sides in and roll up like a jelly roll. Place the strudel seam side down on the baking sheet. Brush the pastry with melted butter. Repeat the process to make the second roll. Bake for 35 minutes or until the pastry is golden brown. Place the baking sheet on a wire rack and let cool for 15-20 minutes. Sprinkle with confectioners’ sugar, slice, and serve. Planning a family vacation often starts with a discussion about the destination. 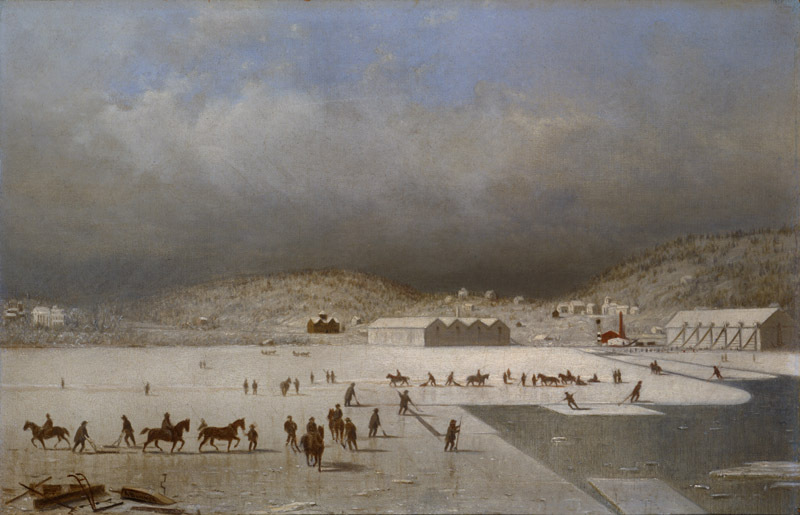 For a winter trip, we might consider two very different types of travel destinations. 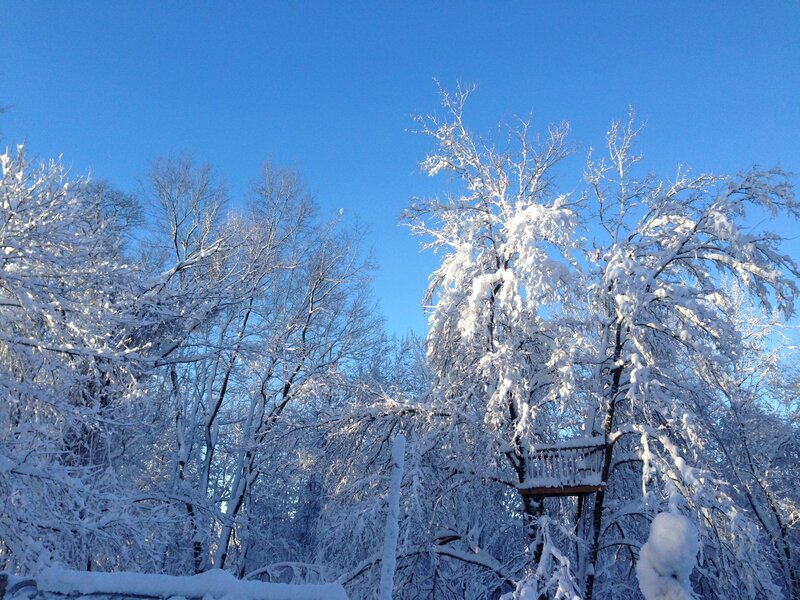 Some might want to embrace the season and opt for a ski trip. While those longing for a break from the cold and the darkness, might choose a trip to the sunny tropics. As my family considered the idea of a family trip, our discussion wasn’t so much about the destination, but about participants. The two experienced snowboarders in the family have been planning to conquer some “real” slopes for a while. The question was whether my daughter (an inexperienced snowboarder) and I would join them on this trip. I must disclose that winter is not my favorite season, and when it comes to mountains, my feelings are mixed. Growing up in an area where the landscape resembles the flat plains of the Midwest, the most memorable hill of my childhood (and the only hill around) was a small artificial sledding hill on the playground. From a safe distance, I do like to admire the beauty of mountains, but when experiencing them close-up, my respect for them often borders on fear. As for my skiing skills, they are minimal. Because of the lack of opportunity, my hometown wasn’t exactly a town of ski enthusiasts either. Although I’ve tried skiing, I have never acquired skills beyond a beginner level. After a few discussions, we came to a decision everyone was comfortable with: The boys would travel to Colorado and enjoy the mountains, while the girls would have a special “girl time” at home. The division of our family into two groups happened this time along the gender lines: it was time for some father – son, mother – daughter bonding! My son and husband packed their bags (so much gear!) and embarked on their adventure. My daughter and I enjoyed our time together at home. We had been getting pictures and news from the boys every day. During our calls with them, the adventures of the day were usually summarized by my son into short sentences—exciting shouts from a high-altitude ski resort. I was glad to hear from them every time. For me, the most important piece of information was that they were well, because to me the majestic Rockies seem a little dangerous even from a great distance. If being on vacation means, breaking away from the usual daily routines, then my daughter and I had a vacation too. We “camped”, along with our dog, in the guest room, watched movies (something we don’t do too often) during the snowstorm, we stayed up later than usual, enjoyed craft projects, and played lots of board games. I mostly neglected cooking, because this week after all was a departure from our everyday lives. We all had a good time, and we concluded that having a one-on-one parent – child ‘vacation’ experience can be as valuable as a trip involving all members of the family. Through my son and husband’s experience, I had a taste of their snowboarding trip. It seemed great, but I still don’t long for a winter vacation in the mountains. Perhaps one day I might want to travel to the Rockies in the summertime. I am quite fascinated by the idea of standing in the rain on the imaginary line of the Continental Divide, knowing that the raindrops coming down on the Eastern side of the mountain might one day meet the waters of the Atlantic, while the precipitation trickling down the West slope is destined for the Pacific Ocean. We eat mostly home-made food. That means lot of time spent in the kitchen. 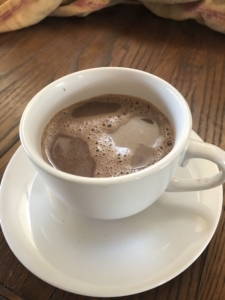 During our unusual vacation-at-home week, I gave myself a little break from cooking. We had mostly salads, sandwiches, and soups. 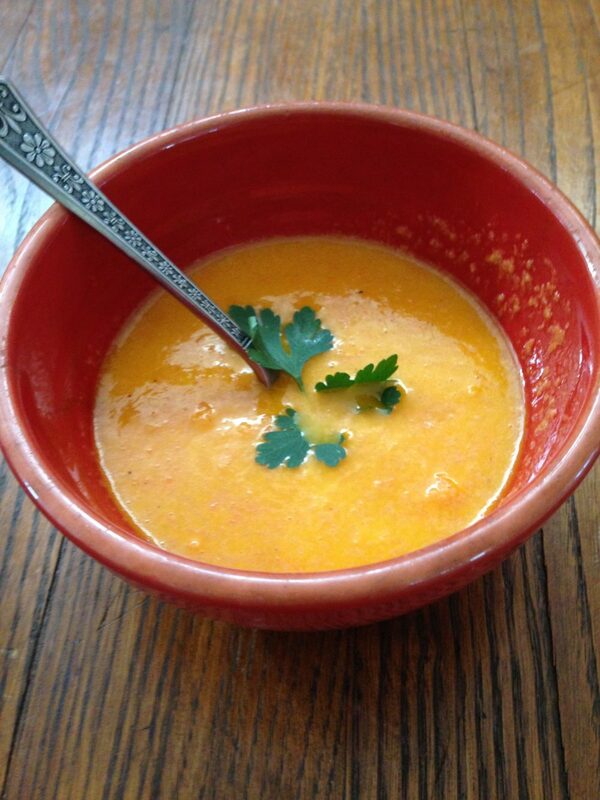 Most soups are not labor intensive and can be made in large batches that last for few days. Many taste even better reheated than fresh. In a large pot heat the butter and oil. On medium heat, sauté onions until softened, about 3 minutes. Add garlic, cook until fragrant, about 1 minute. Add mushrooms and thyme, cook for 5 minutes, stirring occasionally. Sprinkle mushrooms with flour, mix well, and cook while gently mixing for 2 minutes. Add stock, mix and bring to boil. Reduce the heat to low. Add salt and pepper. Add cream and bring back to simmer (not boil). Adjust seasoning if necessary. Mix in parsley and lemon juice. Garnish with parsley. 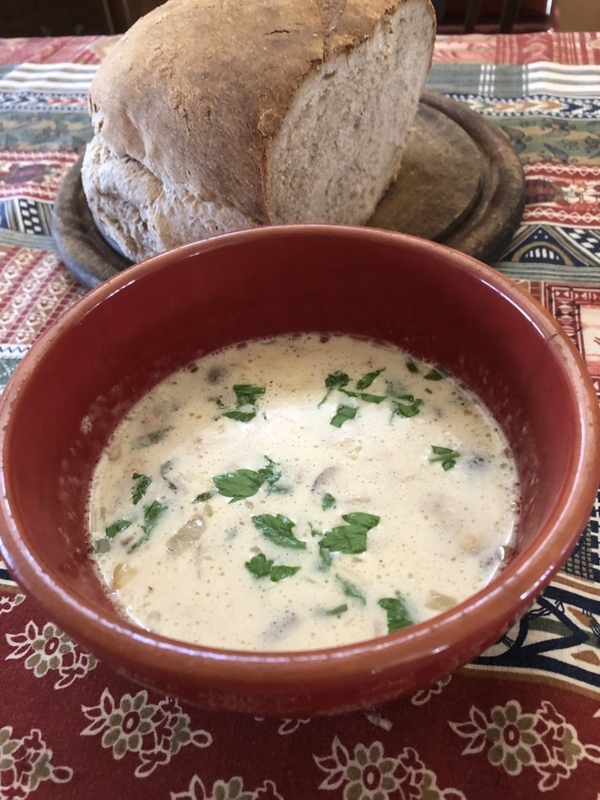 Serve with toast or fresh bread. Traveling with children usually results in a very different experience than getting on the road with adult company. It is not only that when children come along we adjust the pace and the activities to meet their needs and interests. What is truly unique is that we get to see our travel destinations from a different angle, with the refreshing eye of a child. The whole travel experience takes on one more extra layer when we decide to take our kids to places that have a special place in our personal history; when hometowns, college towns, broader areas of our childhood become destinations. We are hoping to include the children in our story, one that is the precursor to their own. 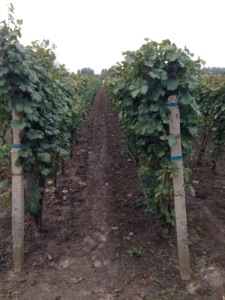 We traveled to Central Europe last fall to visit family, friends, and participate in a harvest in the vineyard (the first one ever for my children). On most of our day trips, we kept crossing paths with the Danube. For me, the Danube is ‘The River’. I was born in a town on the Danube, learned to swim in its waters, and I spent my college years in two cities on the Danube. The river had been part of everyday life, just as it was part of those moments that stood out. There was no New Year’s Day during my childhood without a family walk to the Danube. I always saw it as a New Year’s pilgrimage to experience the cleansing effect of chilling wind carried by the river. So naturally, encounters with the Danube were part of our recent trip. With the children, we strolled on the banks of the river; they threw pebbles, watched ships. We talked about history: times when these parts of the world were the northern frontier of the Roman Empire. “Wait, what? Romans here?” the children wondered. So we went to a museum to see some artifacts and to learn more. Turkish invasion was the next subject…. From my hometown, we walked through a bridge over the Danube and crossed to another country. As history has redefined borders, one town has turned into two: one on each side of the Danube and each in a different country. Luckily, both countries are now part of the European Union, so we were able to enjoy ice cream on the other side of the river without needing a passport. 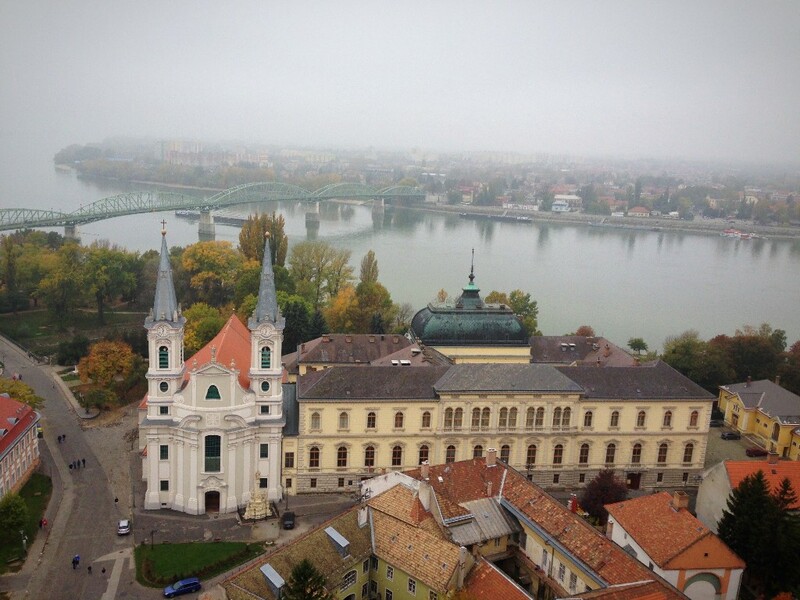 During our trip we stood on several castle hills, all overlooking the Danube. The children imagined themselves to be knights watching the approach of the enemy. They felt lucky to be strategically well positioned and protected in their castles. They were enjoying themselves. But I kept wondering during the whole trip: Are they unimpressed? Does this experience really sink in? Or are these only fleeting moments of fun that will be soon forgotten? After many day trips came the long anticipated day of the harvest in the vineyard. The harvest of vine grapes has a special place in my personal mythology for a simple reason: I was born on the day of harvest in my grandfather’s old vineyard. 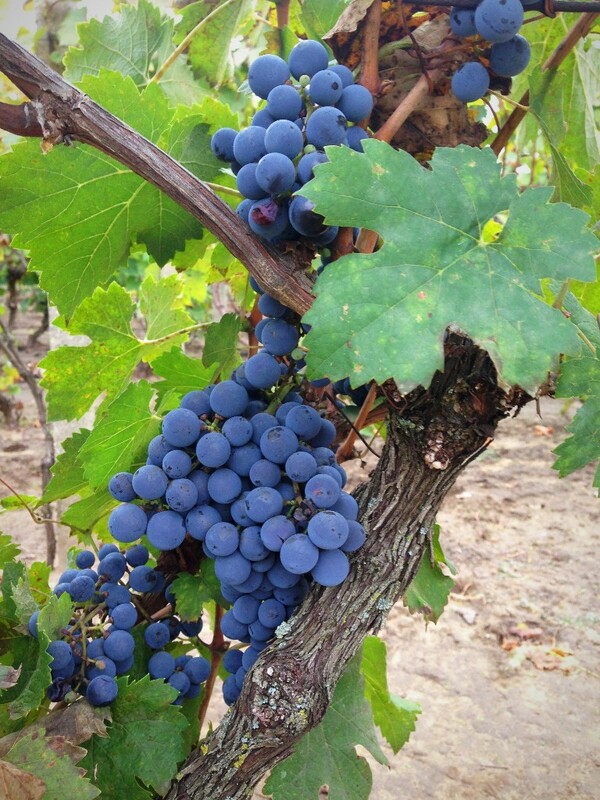 The bulk of the grape harvest in that area happens around Saint Michael’s Day (September 29th). The exact time is determined by the skilled eye and taste buds of the grower/vintner. The right levels of sugar, tannin, and acid are the first step to a good wine. On the day of the harvest, the grapes were plump, ripe, and ready. Probably like my mother’s belly on that day many harvests ago. I was happy that we were there, that my children get to see the vineyard in its full autumn beauty, that they will savor the many tastes of different grape types, all of them so distant from the supermarket varieties. Grape harvest is quite a sensory experience. It is not only the smell and taste of the berries, but how aware we become of our hands. The super ripe berries are no longer able to contain their juices. With each picked cluster, the hands of a picker get more and more sticky from the sweet juice that, like a magnet, attracts dirt, resulting in a gray sugary second skin. Like everything else, grape harvest has its traditions. As for lunch, we had the traditional: roasted duck prepared on the day before (because who has time to cook on a harvest day?) with pickles and bread, and sweet bread for dessert—the perfect food to eat while sitting in the grass at the edge of the vineyard or under one of the peach trees dotting the rows of wine grapes. The life span of grape vines is 50-100 years. Although the vineyard where harvest took place on the day of my birth no longer exists, we went to visit the place where it oncegrew. We looked around in the trees, and there they were: old, woody vines climbing up the tree trunks in search of light, and still bearing grapes. We picked a basketful of this surprise fruit for my grandparents, so they could taste and remember their lost vineyard. My grandfather is fond of grape vines. He made sure his descendants would have no lack of them in the decades to come. At the age of 90, he decided the time had come to plant a new vineyard. And that’s what he did. There is one single grape vine growing in my garden as a fill-in for a vineyard. I bought the plant four years ago in an Italian gardening center without being aware of its variety. The plant bore fruit for the first time this season. With great expectations, I picked a plump berry, and to my surprise, I tasted something very familiar. I recognized the cultivar right away: sweet, aromatic with a thick slip skin. Isabella: one of the varieties that had grown in grandfather’s old vineyard. On the day of the harvest in the vineyard, roasted duck is eaten picnic-style with only bread and pickles. When served properly on the dining table for a fall Sunday lunch, roasted duck and goose are often accompanied with a side of braised cabbage. 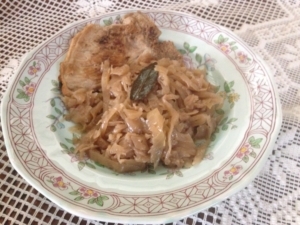 Braised cabbage is also a nice side dish to be served with pot roast, roasted ribs or any other roasted meat, including game. Sprinkle the shredded cabbage with 1 ½ teaspoon of salt and let it stand for 30 minutes. Squeeze out the cabbage and discard the liquid. Using a large heavy-bottomed casserole, heat the oil or lard and sauté the onion until limp. Add the sugar, stir and let it lightly caramelize. Add the cabbage and seasonings. Pour on the water, bring to a simmer, and cover. Gently simmer, stirring occasionally, for about 3 hours or until tender. Great fresh, and even better reheated the next day. Who doesn’t sometimes dream about faraway places, thrilling escapes, change and new experiences, about being a stranger in a welcoming place? Most of us probably do here and there. Although partly for different reasons, the idea of travel excites children as well. And that is why we travel, and why we take our kids along. We cultivate their curiosity; we want them to see and experience; we give them the possibility for learning, for transformation and for reevaluating their self-concept. Travel suggests hope, things to discover and find, change, and a new perspective. In the upcoming issues of The Dirt, we will travel through cooking. The road will take us to countries, towns, and villages that I have visited or that I, along with my children, dream to see someday. It took us more than eight hours to get to Downeast Maine. It was a long car drive – uneventful in a good way. A flight of a similar length could have taken us to Rome, Italy; Helsinki, Finland; or Lima, Peru. But we didn’t leave our continent, our time zone, and not even the country. We did, however, leave behind some of the summer heat and our everyday life. Not too much planning went into this trip. 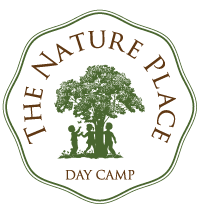 We wanted to take the children to Acadia National Park, to see some friends, to visit a goat farm we have been to once before (because their cheese was simply unforgettable), to relax and do whatever felt best on a particular day. The minimalistic plan seemed to work well. The children were the most happy engaging in unplanned simple activities like seeing a harbor seal (well, just its head) or a starfish, collecting shells on the beach, looking for sea glass, jumping the cold waves, petting goats and kittens on the farm, harvesting blueberries with an old-fashioned blueberry rake, or watching fisherman unloading their catch. They enjoyed the beach, which was so different from their idea of a beach or the familiar Jersey Shore: rocks instead of sand; no palm trees or grasses, but tall, dark conifers. These were not the balmy waters of the Caribbean but the rough and raw northern coastline. The space seemed so big, so stretched out. Even in the midst of the tourist season, it wasn’t hard to find a beautiful beach that we could have just for ourselves. It was mid-August, and it was blueberry season in Maine. We couldn’t miss a visit to a blueberry farm. Our journey took us to a quite unusual one. The farmer was a former New Yorker who, I suspect, decided to trade the unpredictability of markets and corporate life for the unpredictability of nature and its elements. He was not only a farmer but also a sculptor. He cultivated his fields, and gave form and meaning to enormous pieces of basalt rock. After all, in both capacities, he was taming the nature. 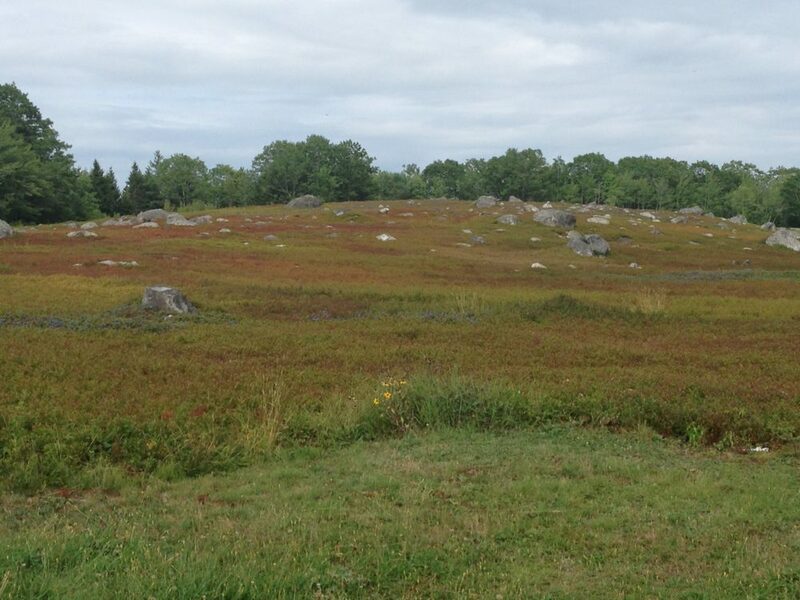 We left the farm with several pounds of wild blueberries. Some got eaten fresh and we froze the rest. The frozen ones made the trip back to New York with us and became part of our winter provision. Every time we will take some out of the freezer to make a sweet treat, they will remind us of Maine and the mysterious field that gives life to wild blueberries. results will surely be yummy. This is a quick frozen (or almost frozen) dessert for a warm autumn day. The recipe is so simple, even your six-year-old could prepare a treat for the family. 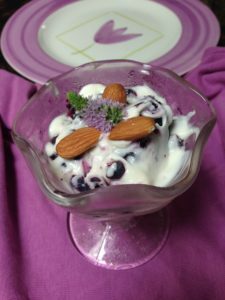 In a mixing bowl, combine the frozen blueberries with vanilla yogurt. Work fast and make sure the berries get covered in yogurt. (The yogurt will freeze over the blueberries.) Fill four small dessert bowls with the mixture. Decorate with fresh fruit, nuts, or whipped cream. Serve and enjoy immediately before the blueberries get defrosted. of a child. Finding the right name for a new baby is often a long process full of careful considerations. Many factors play a role: our origin, cultural and religious background, education, and our hopes regarding the future of our offspring. Finding a name for a newly born baby means naming without knowing who that baby really is as a person. We can only imagine the personality or ‘grown-up looks’ of our newborn. We hope that the name will be a good fit for the child’s personality and a good fit within our family and society (regardless of whether our priority is “to fit in” or distinguish our child from the crowd). The Latin proverb “Nomen est omen” captures he predictive power of a name, and is certainly at least partly true. A name puts a person in a social and cultural context. Unfortunately, it can result in stereotyping people, and can lead to assumptions, not only about our origin or social status, but also about our behavior. I was walking in my garden admiring the newly emerged plants when these thoughts about naming began to occupy my mind. It was because some lovage had caught my eye. A lovely plant with an even lovelier name. Lovage is an old European herb widely used in medieval kitchens and herb gardens, but largely forgotten today. So forgotten, that the word didn’t even make it into the spell-check dictionary on my computer. As I was writing this text, the spell-check constantly indicated that there is an error in the word lovage. My mind kept wondering about the origin of this strange word and whether “Nomen est omen” applies to plants. 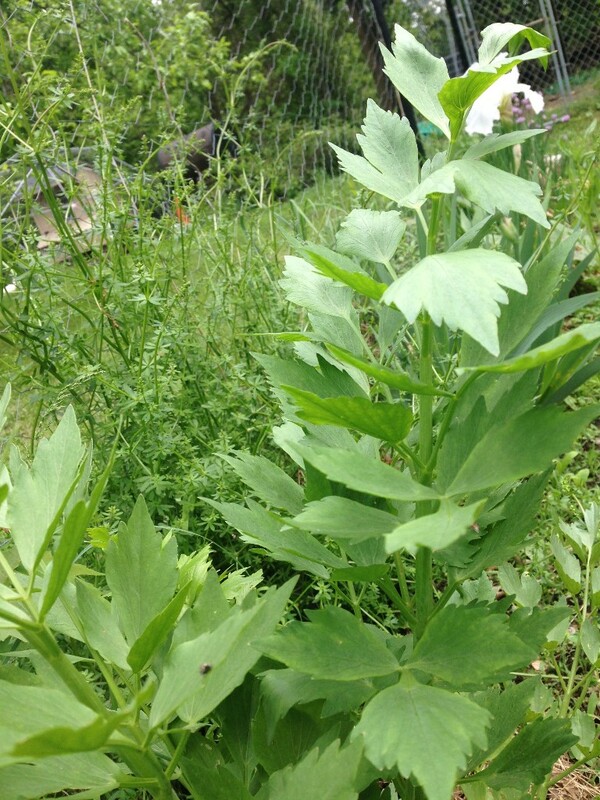 Lovage looks little like a celery (although unlike celery, it can grow up to 5 feet tall). Its flavor also reminds most people of celery, but it is stronger, more complex, and more aromatic. Personally, I like it a lot. Beneficial insects like it too. If lovage were widely known, my guess is that its strong flavor would generate either a “love it” or “hate it” response in most people; nothing in between. The plant belongs to the same family as carrots, parsley, and dill. Its leaves, stalks, seeds, and roots are all edible. In the past, candied stalks and roots were used as a remedy. Leaves work well in salads, soups, and stews. Ancient Greeks chewed the leaves to improve digestion. Hildegard von Binden used lovage as a culinary herb, and recommended it as a remedy for colds, heart problems, and abdominal pain. This soup gets its unique flavor from lovage leaves. If you can’t find lovage, use parsley or celery instead. Your soup will be tasty in a very different way. In a soup pan, heat the olive oil. Add the onion and gently cook until translucent. Add the potatoes and stir well. Add the vegetable stock and simmer for 15 minutes. Add the whole lovage leaves and simmer for 5 more minutes or until the potatoes are tender. Take the soup off the heat. Remove the lovage leaves and use a hand blender to puree to soup. Check the seasoning and add salt and pepper to taste. Add dill and vinegar, and return the soup to the heat for a few minutes. Do not boil. 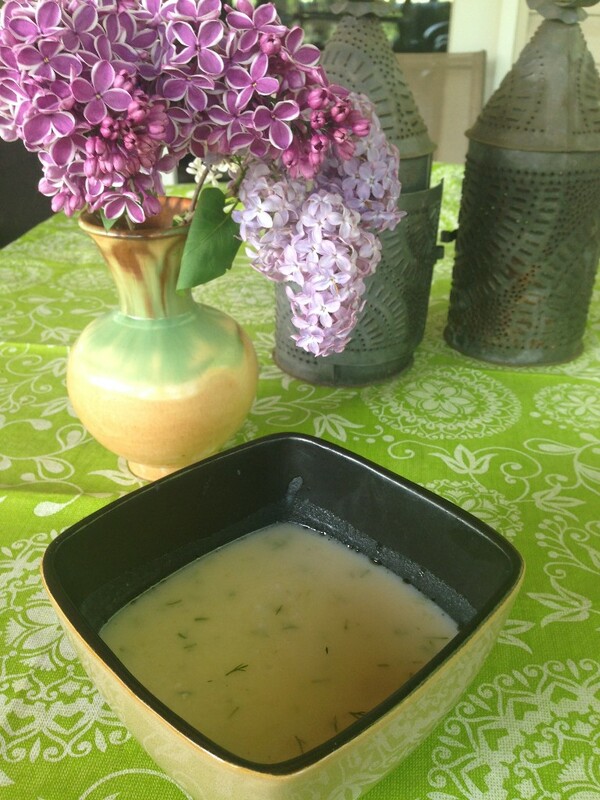 Put soup into serving bowls and garnish with chopped lovage. Serve with a dollop of sour cream if desired. After what felt like an almost never-ending winter, it is a great joy to finally enter the season of budding colors. Snowdrops, violets, and skunk cabbage might be the first signs of spring, but they never quite convince me that the winter is gone for good. It is when the leaves on the trees emerge that I feel assured: there is no way back to winter-land. The change of scenery is usually sudden. With it, nature bursts into color. We leave behind the lifeless shades of grey and brown and celebrate the soft colors of spring. Shades of fresh green, with occasional dots of color, dominate the landscape. Comforting and calming colors of early spring slowly mature and change. Plants soak up the sunshine and richer colors come to life. The color palette of nature reaches near perfection on a wild flower meadow in June or on a field of wild lupine in July. As the year progresses, the colors of nature become even more full and rich. The warm shades of the fall landscape bring another visual highlight of the year. The reds, golden yellows, oranges, and rusty browns radiate back the energy of the sun as if to charge us with energy before the world around us fades again into the greyish-brown realm of early winter. Nature has everything we need, including color. In fact, there were no synthetic dyes until the mid 19th century. Still, the world of humans had not been colorless. Until then, dyes and pigments came exclusively from nature. Think of old masters: Michelangelo, Botticelli, Vermeer, Rembrandt, Bosch…. They painted with the colors of nature. The fibers of traditional oriental rugs and renaissance tapestries were all dyed with natural materials. So were the luxurious dresses of emperors and empresses of the past. Fabrics of rich colors symbolized status, and their cost was high. Lower classes dressed in browns and grays, shades that were the easiest and cheapest to create. 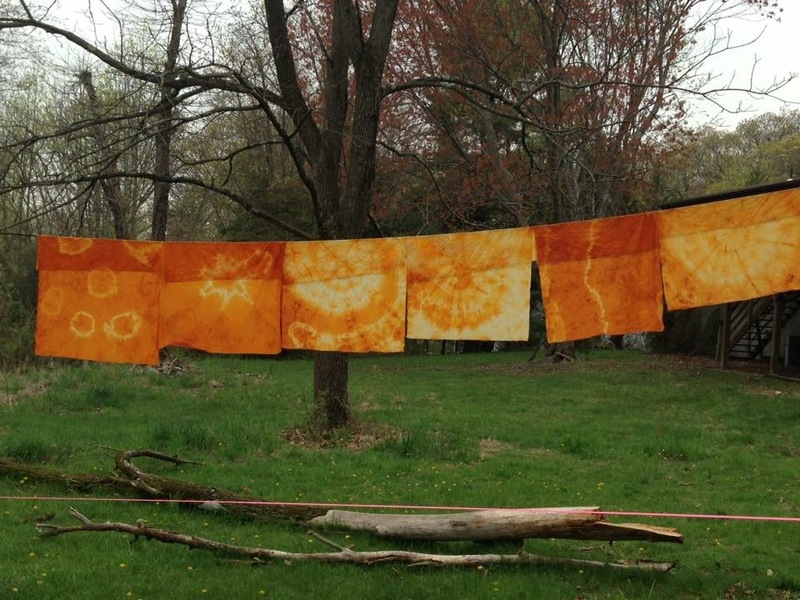 Dyeing is not unlike cooking. It involves applying heat to extract, in this case, not flavor but color. A large pot is utilized to make a dye bath. The plant material gets simmered in water in order to extract pigments. Then fabric or fiber is immersed in the (warm or cold) colored liquid to absorb the dye. Some dye material might be hiding in your kitchen. Tea, coffee, turmeric, or onion skin all contain pigments that get easily absorbed by natural fiber or fabric. Henna used for tattooing and dyeing hair also creates beautiful rusty reds on fabric. The process is fun and satisfying. We can start by collecting plant material suitable for dyeing (marigold, goldenrod, black walnut etc. ), then we cook the colored brew. If our goal is to create a solid color fabric, we just need to put the textile into the dye bath. Otherwise, we apply our artistic imagination and prepare the fabric by folding it to create pattern. I like to get inspired by the techniques of ancient Japanese Shibori. When working with plant dyes, we get the satisfaction of knowing that the colors come from renewable resources rather than petroleum. Natural material such as silk, wool and cotton absorb the dyes well. Although the use of mordants (solutions that act as binding agents) usually results in richer colors, for safety and environmental reasons, I prefer not to use them. Feel free to experiment. Nature is forgiving. Even unexpected results have their beauty. Sometimes we end up with a color or pattern that is much more beautiful than anything we could have planned. Mother Earth provides everything we need. Annatto seeds come from Central and South America. Traditionally, they were used as body paint. Annatto is widely used today as a food coloring. The orange color of the supermarket cheddar comes from these seeds! Annatto dye bath produces yellow, golden yellow, orange-yellow, or orange hues, depending on the amount of seeds used, and the weave and thickness of the fabric. Silk and wool can also be successfully dyed with annatto seeds. Choose white or off-white fabric/bandanas for your project. Unbleached fabric will produce deeper color. Gently simmer the annatto seeds in about a gallon of water for one hour. In the meantime, fold the fabric using one of the Shibori techniques. This is a link to one of many videos showing how to use the Shibori folding techniques. In this video synthetic dyes are used, so please disregard their dyeing instructions. Gently rinse the folded fabric in lukewarm water, making sure that it is wet throughout. This will assure even absorption of the dye liquid. Turn off the heat under the pot. The dye liquid can be strained, but leaving seeds in the dye bath during the whole dyeing process will produce richer color. Put the fabric into the dye bath and let it steep for at least 4 hours or overnight. Take the fabric out of the pot. Rinse under running water and squeeze out excess water. Unfold the fabric and be ready to be surprised! Put out your fabric to dry. Before further use, hand-wash the dyed fabric. How we manage our time is an important factor in our daily lives. Re-evaluating my daily routines, I came to the conclusion that I have been spending way too much time with cooking and subsequent kitchen cleanup. It was time to simplify my kitchen activities. Inevitably, many questions crossed my mind: How do others do it? What is wrong with my approach to daily food preparation? How can I simplify things for myself while still serving a homemade meal for my family every night? Is more planning the answer? More improvising? Would an instant pot save me? Or should I start cooking huge batches of food that will last 2-3 days? I considered the eating habits of my family and those around us. As eaters, we are global citizens for sure. We have access not only to local and seasonal produce, but fruit, vegetables, spices, seafood etc. from all over the world. Without having to travel, we can enjoy cuisines of different nations in local restaurants. In our culture, eating has become much more than sustenance. We don’t only eat to provide nourishment for our bodies—sometimes we eat for the sake of the experience itself. We try exotic foods we haven’t had before. We are drawn to haute cuisine offering combinations of flavors and textures that are intriguing, surprising, even provoking. Celebrity chefs often take dinning to conceptual levels where cooking borders art. A chef engaging in molecular gastronomy seems to be far removed from a cook. They are partly an artist, partly sort of an alchemist trying to extract the true essence of the ingredients. These chefs might serve things that go far beyond unusual: flavored airs and vapors, or a hot cauliflower ice cream that melts as it cools. These are exciting trends, but they certainly can not be reproduced in my kitchen, and to me they stand in sharp contrast with food as a necessary fuel for our bodies. 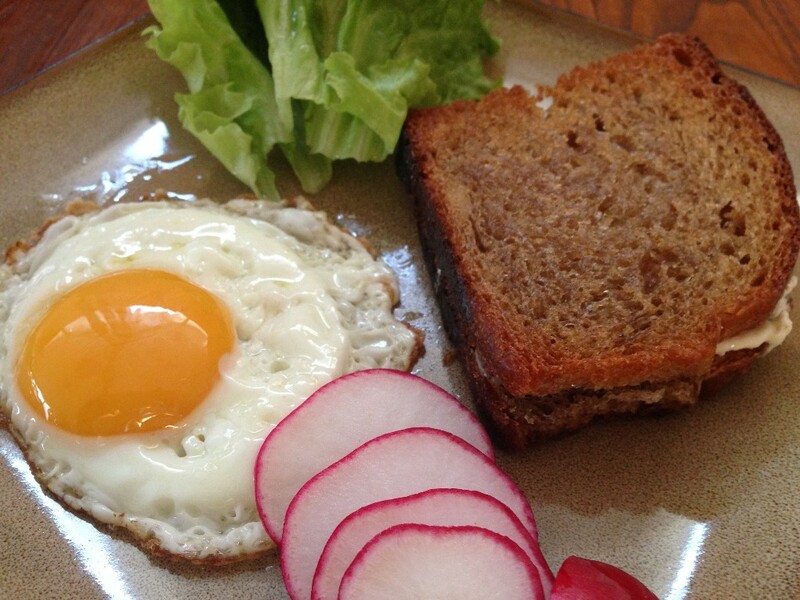 In the past, just several generations back, homemade food was the only option for most people. As I wrote last month, it was mostly women who cooked every day. We would probably label the everyday food of those days as a simple and possibly boring fare. The majority of households had access to only seasonal and local produce, which meant that the menu was simple and without too much variety. Food that was relatively expensive, rich in calories, and required elaborate cooking methods, was reserved for special occasions and holidays. Wait! What? Realizing all this, I came to understand the root of my cooking problem: We eat almost every day, as it was a holiday. We need to simplify. The question that needs to be answered is how to embrace simplicity without the feeling of loss. If simplifying feels like “giving up” something, then it is not sustainable long-term. I have decided to give it a try. Simpler cooking and eating saves time, money, and environmental resources. Simple meals and simple techniques make it easier to pass on cooking skills to my children. And most children will certainly enjoy a piece of roasted chicken served with plain rice more than my elaborate chicken biryani that (beside the monetary expense) comes at the cost of half a day of my time anyway. Like trying to appreciate the overlooked details of everyday life, I will try to value earthy, rustic, and simple foods because they fit into the puzzle of a wholesome life. This is a simple porridge-like dish made with coarsely ground yellow corn marketed as polenta (although polenta is really the name of the dish). I prefer to use organic polenta found in the bulk section of health food stores. In a heavy saucepan, bring water to boil. Gradually add polenta, stirring with a wooden spoon. Add salt. Reduce heat to low and simmer, stirring often, until polenta starts to thicken (about 5 minutes). Cover and cook for 30 minutes, stirring every 5 minutes. 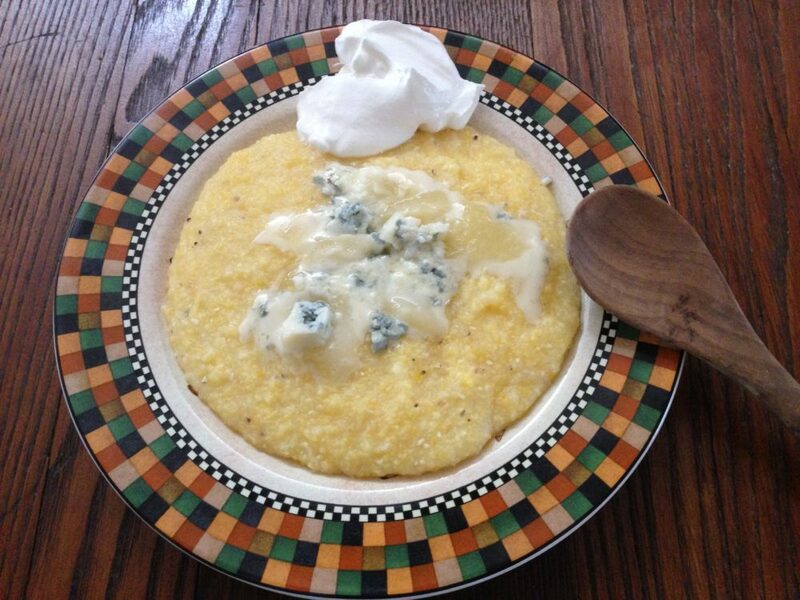 Polenta is done when texture is creamy and it starts to pull away from the side of the pan. Divide polenta onto four plates. Top with cheese and sour cream. Serve immediately. For a dairy-free meal use caramelized onions as a topping. I love to cook, but I am not always ready to admit to this. Although growing interest in quality food and the cooking experience itself is bringing more and more home cooks of both genders into the kitchen, the daily food preparation for a family is still often viewed as mostly a “women’s job”. Women who embrace this activity are unfortunately still seen by some as ‘homely’, possibly not emancipated, or even not skilled to do anything else. I am often reluctant to talk about my hobby because of this negative stigma—a result of patriarchically established gender roles. The notion of cooking as a gendered activity has been strongly present in our cultural tradition. Cooking was traditionally perceived as a woman’s mundane job—one that almost anyone can do—not as a true skill or craft, thus underscoring the subordinate position of women in society. Cooking, in the realm of the domestic life, was reserved for women, while food production outside of the sphere of private life belonged to men. The bakers and butchers of patriarchal societies were always men. The low status of domestic kitchen work stood in sharp contrast to the much higher status of the work performed by these ‘skilled craftsmen,’ who were always men. These lines sound amusing or sad today, depending on the perspective. No doubt, a lot has changed since The Sixties. Men not only venture to the supermarkets to do the weekly shopping, many men cook. Some of them share kitchen activities with their partners, and there certainly are families were the man is the primary presence in the kitchen. But, often, men interested in food and cooking don’t take on everyday cooking projects. Rather, they engage in occasional and distinctly ‘masculine’ activities, like making and smoking sausage or jerky, curing bacon, or cooking meats outdoors. With these, they are clearly not entering the world of ‘housewives’, but – one could say – they are embracing the ‘hunter’ within. These manifestations of traditional gender roles raise the question: how can we navigate the kitchen with our children of any gender, and how can we cultivate a love of cooking that continues to break down limitations and stigmas for future generations. My first and only rule is to engage my children. Chores and tasks should be assigned based on their age, interests, and personalities, rather than on gender. Children love hands-on activities. Most of them are happy to participate if they feel useful. If engaged in simple kitchen projects from an early age on, cooking becomes a “normal” part of a child’s repertoire of activities, a habit that won’t be question later in life. I recommend not taking risks at first. Start with activities your kids will like for sure. A young child will love to wash salad greens, a variation on water play. Washing dishes might can be made into a fun activity for an older child. Working with bread dough is very much like playing with play dough. And mixing is always so much fun! Yes, it would be much faster and much less messy for us adults to complete these jobs, but we need to exercise patience and let them do the work. This is how our children learn. The cleanup time is our long-term investment in their lifelong habits and hobbies. I like to think of kitchen as (among many other things) a place where children can learn how to collaborate, a place where we can strengthen family relationships, and even gently fight gender stereotypes. This is an easy recipe to make and a very impressive one as far as salad dressings go. Anyone can make this one. No cooking experience is needed, but you will need a blender. Make sure to supervise your children while they use the blender. This wholesome dressing works not only on salads, it can also be used as a dipping sauce for raw and steamed vegetables, or even served over meats. Put all ingredients into a blender. Cream until smooth and creamy with no chunks. This is a very large batch. Feel free to halve the recipe.